This grant’s purpose is to cover some financial strain for the family who is going through the unimaginable. We believe that no child should fight their illness alone, no matter the hardship. We want to buy time so the family can spend as much time with their child as possible, instead of at work making ends meet. Families need all the help they can get to remain family strong! Child MUST have a prognosis of 6 months or less. This grant does not exceed 6 months. This grant does not exceed $2,500. Alana Rose Foundation MUST be notified when the child passes. If you meet all of the above qualifications and requirements, please fill out your information below. If not, please go to our General Intake Form. 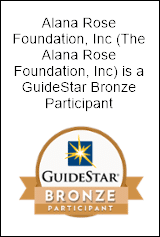 By filling out this form, you give The Alana Rose Foundation permission to discuss the information provided with the child's doctor, social workers, and personnel at The Alana Rose Foundation. We do not share your information with third parties nor sell any information that you provide. We have a log that we use to document our payment history. Please name other contact method. All information is needed for assistance purposes ONLY. Account information will be discarded after payment, excluding confirmation numbers and receipts. No other parties/individuals will have access to this information. We will not ask for more information while accessing your account on your behalf.